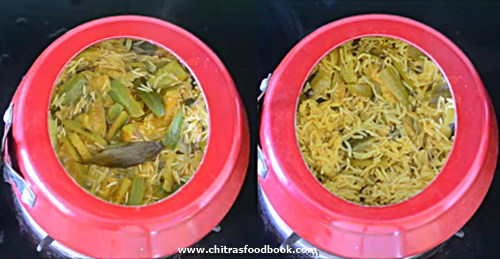 Cabbage peas biryani (Muttaikose pattani biryani in Tamil ) is an interesting biryani recipe that many of us never thought of making it. In my family, both Sendhil and Raksha are not a big fan of cabbage just because of its smell. So I always look for some flavorful recipes like cabbage kurma, cabbage vada, cabbage sambar where the smell of cabbage should not be dominant. 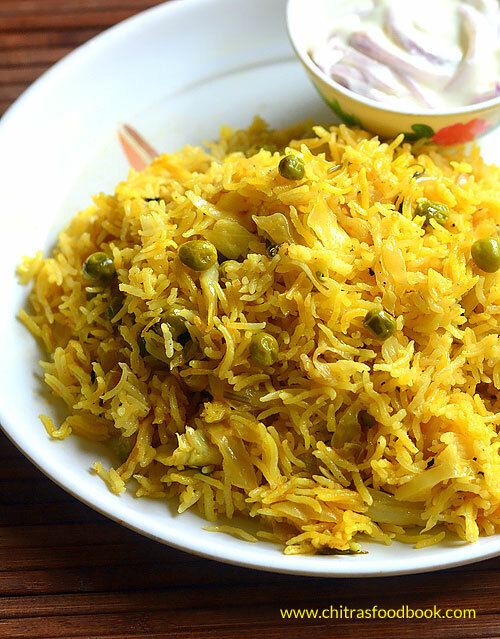 This Indian cabbage peas biryani is one such recipe. 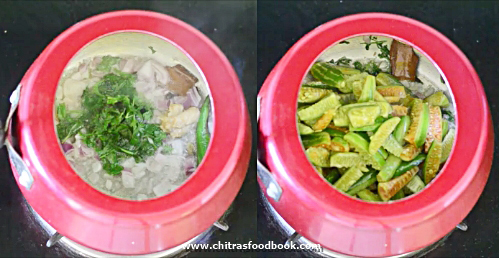 Its a very simple recipe that can be prepared in a pressure cooker directly. I tried it for our Sunday lunch. It came out so well. Everyone liked and had it without any complaints. The best part is you cannot even find a trace of cabbage’s raw smell in this biryani. 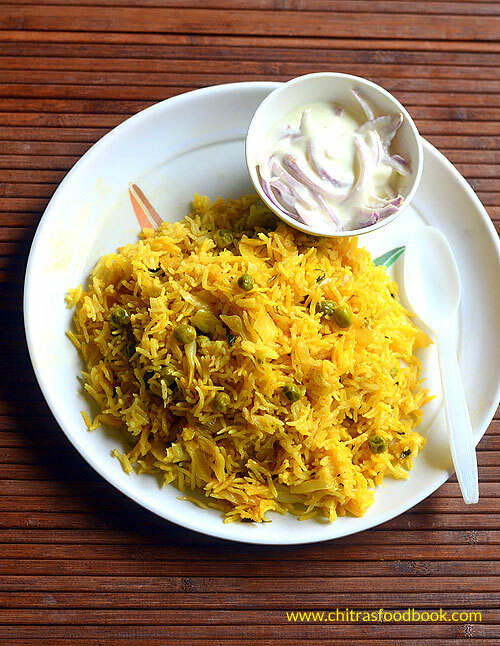 Working women and bachelors can make this cabbage rice for your lunch box easily. 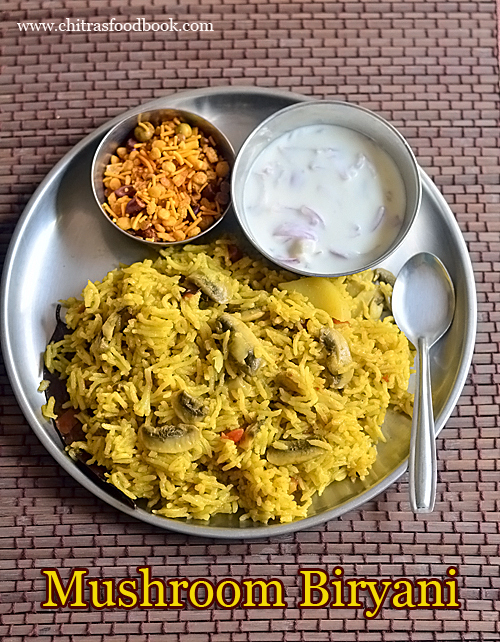 Lets see how to make South Indian cabbage biryani recipe with step by step pictures. 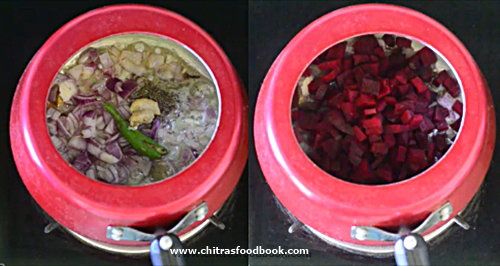 Check out my Purple cabbage poriyal, Purple cabbage salad, Cabbage stir fry, Cabbage kootu recipes too. 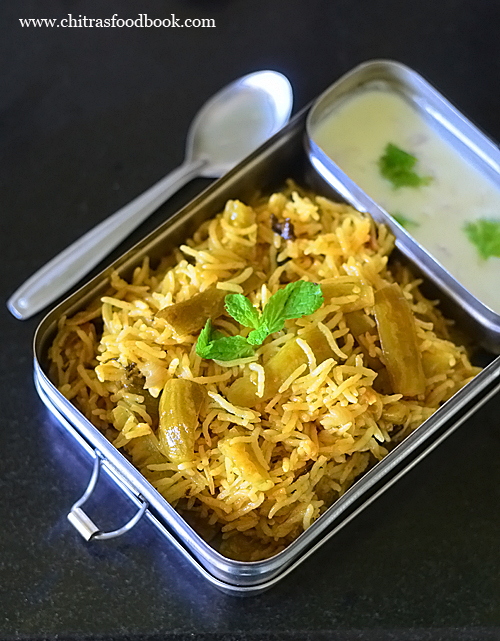 How to make cabbage peas biryani recipe for lunch box. Wash and soak basmati rice. Wash and chop cabbage, onion and set aside. In a pressure cooker base, heat oil , ghee. Saute the biryani masala spices. Add sliced onion, gg paste and green chilli. Saute till onion becomes transparent. Add chopped cabbage , green peas and saute till it shrinks. Then add spice powders and salt. Saute for a minute. Add mint + coriander leaves. Mix well. Add soaked rice, water, curd. Fluff the rice gently with a fork without breaking the rice. 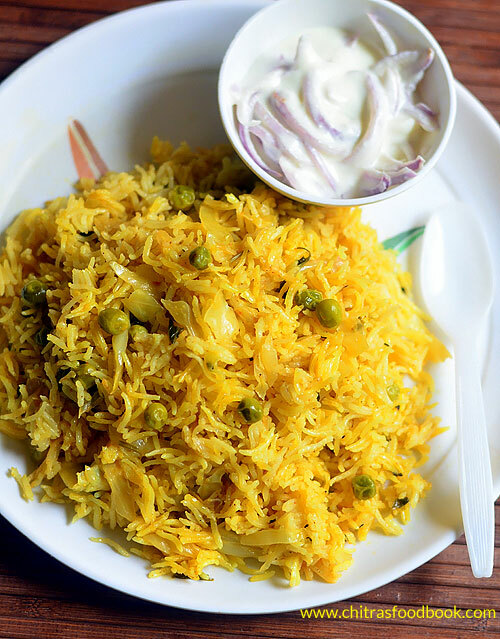 Serve cabbage peas biryani with onion raita ! Wash and soak 1 cup of basmati rice in 1.75 cups of water for 15 to 30 minutes . Wash and chop cabbage into thin slices. Chop onion, green chilli and set aside. Heat oil + ghee in a pressure cooker base. 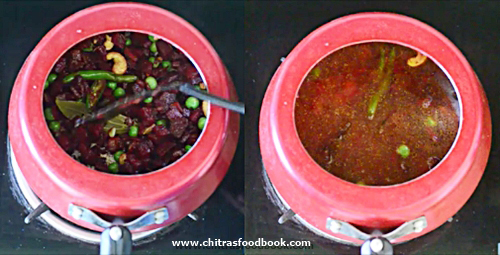 ( I used a kadai and transferred to a pressure cooker later). Splutter cinnamon, cloves, cardamom, bay leaf, star anise and black stone flower. Add onion, green chilli and ginger garlic paste. 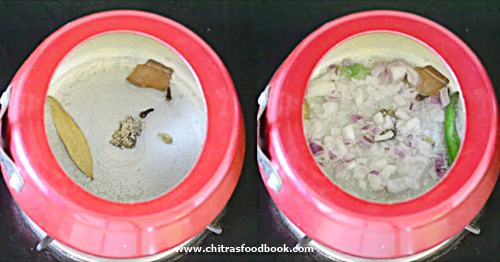 Saute till onion becomes transparent and raw smell of ginger garlic emanates. Add cabbage, frozen green peas and saute till it shrinks. Add red chilli powder, turmeric powder and garam masala powder. Add mint + coriander leaves and saute for a minute. Add curd and mix well. Add soaked rice, water, salt and lemon juice (optional). Mix well and pressure cook in low flame for one whistle. Open the cooker after the steam is released. Mix gently with a fork without breaking the rice. Serve hot with onion raita ! Adjust the quantity of spice powders as you like. 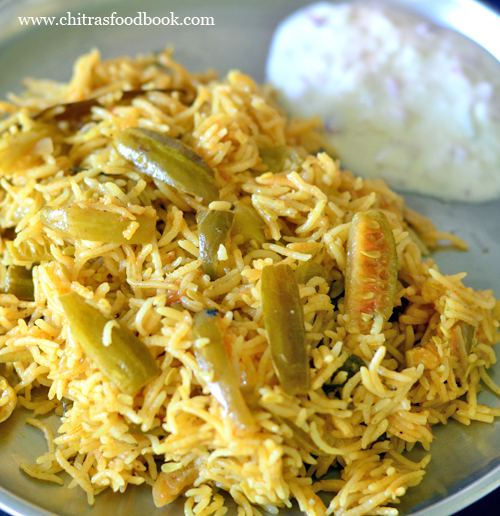 You can add 1 chopped tomato instead of lemon juice but color of biryani changes slightly. 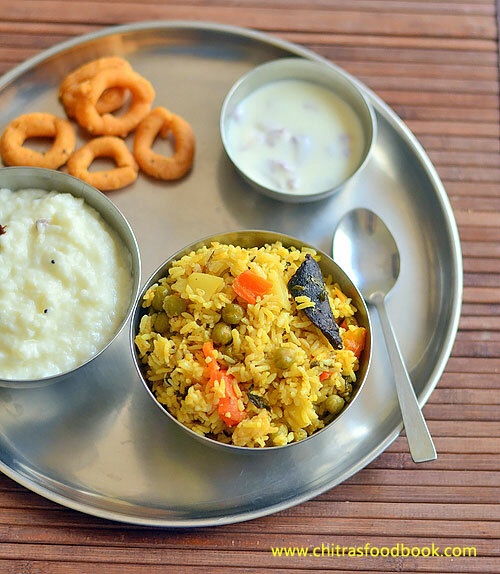 You can also use jeera rice / seeraga samba rice instead of basmati rice. 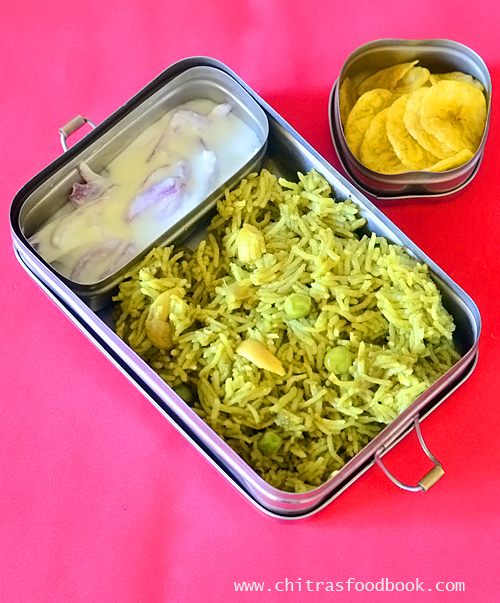 Try this easy, yummy cabbage peas biryani and share your feedback with me ! 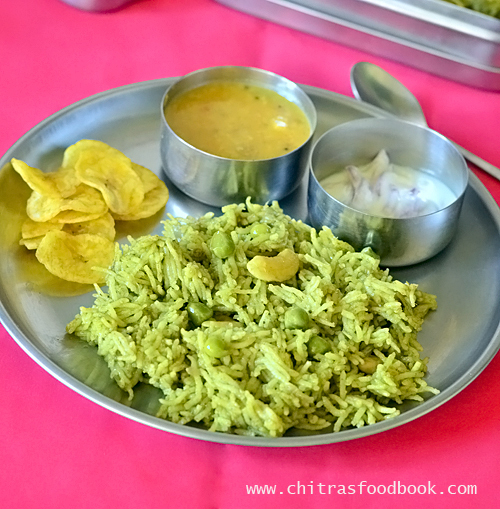 Brinji rice is a very popular rice variety in small hotels in Chennai. 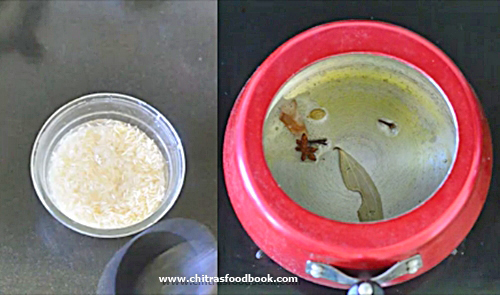 Long back I had shared a plain brinji recipe with coconut milk. 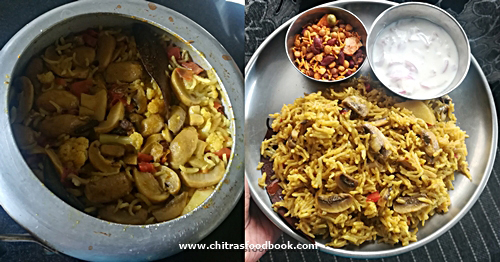 Recently I came across a vegetable brinji rice recipe(Brinji sadam in Tamil) in Eesha’s kitchen YouTube video which is completely different from my earlier version. So I tried it for our Sunday lunch. I am not sure if this the original Chennai brinji rice. But it came out well and tasted more like biryani/ pulao made with coconut milk. We all loved it. But I felt there is no much difference between the taste of this veg brinji and biryani. There are many versions available for this particular recipe. Some recipes call for using freshly ground masala. 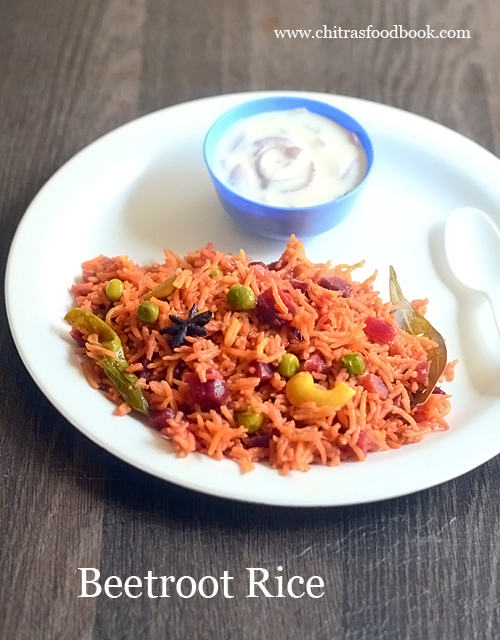 As I had already shared a plain brinji sadam recipe, I wanted to prepare it with vegetables. 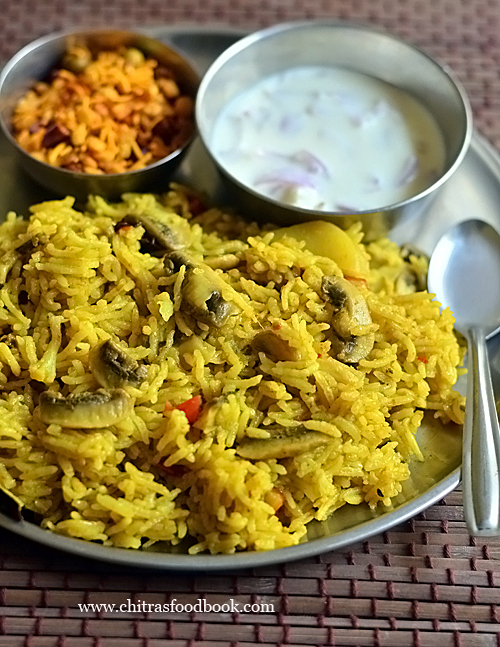 Friends, If any of you know the authentic Chennai brinji rice recipe, please let me know. I am ready to try again and update this post. I have used jeera rice as its popularly known as brinji rice. 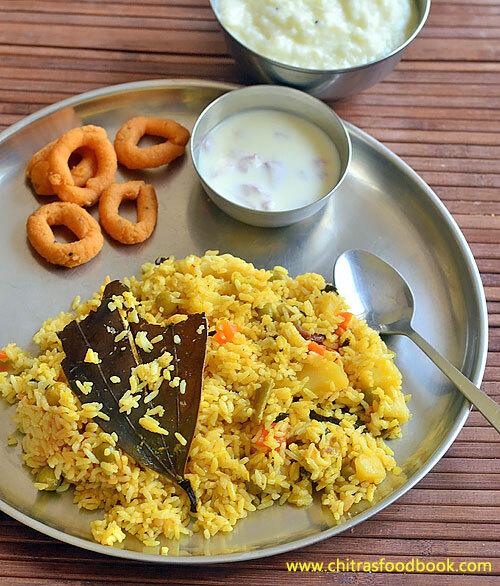 So you can call this rice as Seeraga samba pulao as well. In the original recipe, it is prepared with basmati rice. 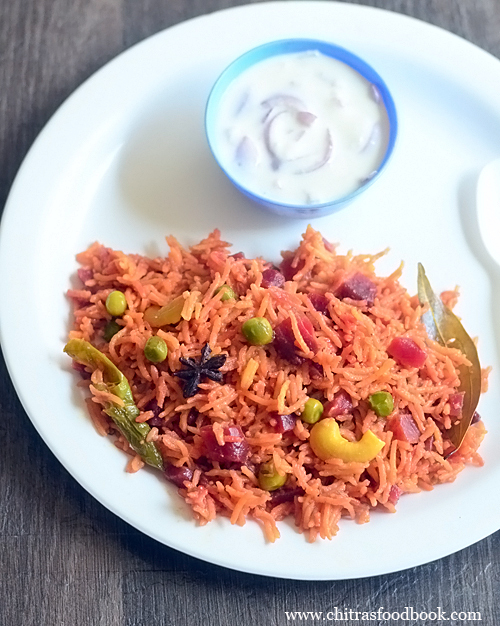 So you can also use basmati or even Sona masoori raw rice to make this brinji. But the flavor and the quantity of water varies. For variations, you can add fried bread pieces at the end. As this recipe has no grinding job and done directly in a pressure cooker bachelors can give a try and pack it for your lunch box. 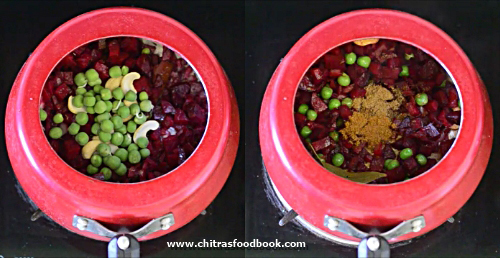 Ok, Lets see how to make Tamil nadu style Vegetable brinji rice with step by step pictures. 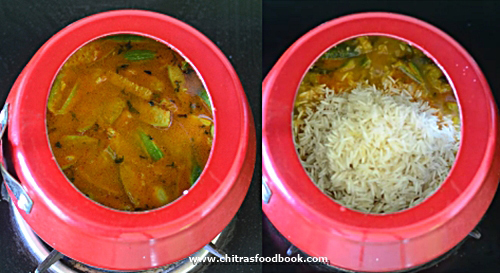 Check out my Plain brinji rice recipe, Jeera rice veg biryani and my 40+ veg biryani varieties. 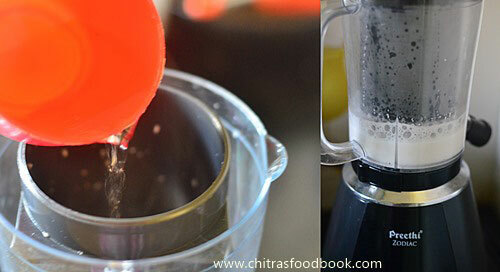 I used my Preethi Zodiac mixer grinder for extracting coconut milk easily. So I have shared separate step by step pictures for the same. Please check it out if interested. Preethi zodiac has really made my cooking much easier by helping me in chopping, grinding, atta kneading etc. Friends, you can think about buying this product if you are planning to change your old mixer. Take the coconut and cut into small pieces. 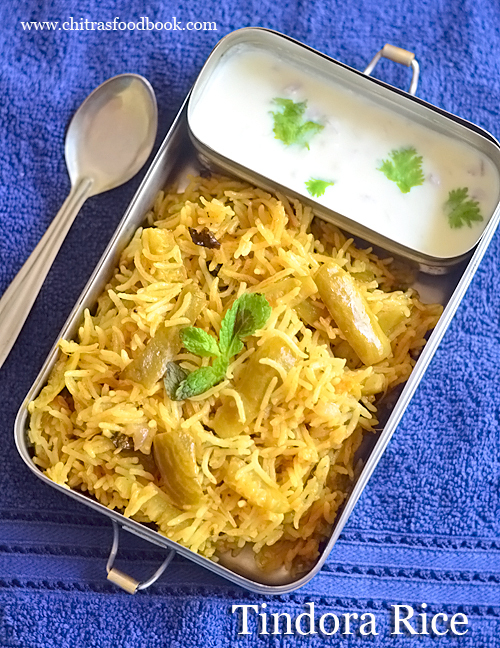 You can also use grated coconut. Now take the super extractor jar and fit the blade. Cover the spout with the cap. Put the coconut pieces and grind to a coarse paste without adding water. Now add the required warm water ( 1:1 ratio of coconut and water for thick milk) and grind continuously.Coconut milk collects in the jar. Pour into a bowl and use as required. Wash and chop all the vegetables into small cubes. Set aside. Heat oil + ghee in a pressure cooker. Saute the whole garam masala. Add sliced onion and saute till transparent.Saute GG paste till raw smell goes off. 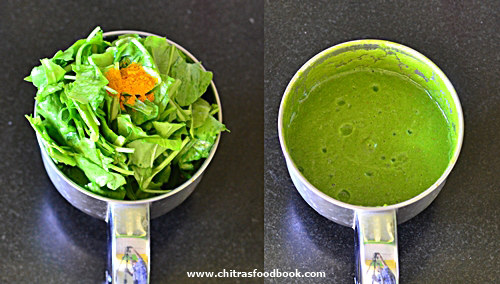 Add green chillies + mint leaves. Saute for a minute. Saute tomato + coriander leaves till mushy. Add spice powders, salt, curd and mix well. Lastly add water, coconut milk and let it roll boil. Add washed rice and pressure cook in low flame for one whistle. Remove the lid after steam is released. 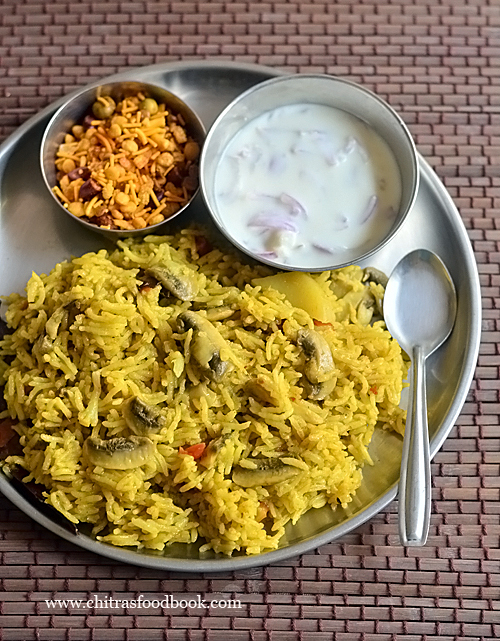 Fluff the rice and serve hot with raita, kurma or brinjal gravy as side dish. Wash the rice, drain the water completely and keep aside. No need to soak if using Jeera rice/ seeraga samba rice. If you are using basmati rice or raw rice, soak for 30 minutes. Wash and chop vegetables into small cubes, slice onions, finely chop tomato. Heat oil in a pressure cooker base. Saute cinnamon, cloves, bayleaf, black stone flower and crushed cardamom. Add onion, gg paste and saute till onion turns transparent. Add slit green chilli and mint leaves. Saute for a minute. Add tomato pieces, coriander leaves and saute till tomato becomes mushy. Add turmeric powder, red chilli powder and salt. Saute well and add curd. Mix well. Add water and coconut milk. After it comes to roll boil, add washed rice. Mix well and cover the cooker with a lid. Pressure cook in low flame for one whistle. Remove the lid after steam is released. Mix gently and serve hot with onion raita, vegetable kurma, Biryani brinjal gravy, tomato gravy etc. 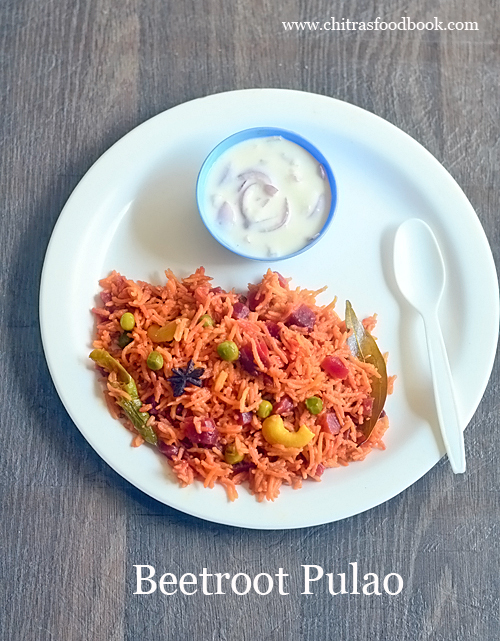 You can also use basmati rice or raw rice. In that case, soak the rice for minimum 30 minutes and use 1: 1.5 cups to 2 cups of water. 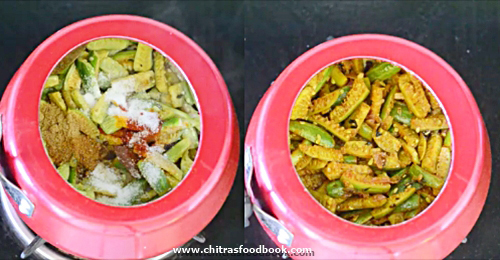 You can skip red chilli powder and use green chillies alone. 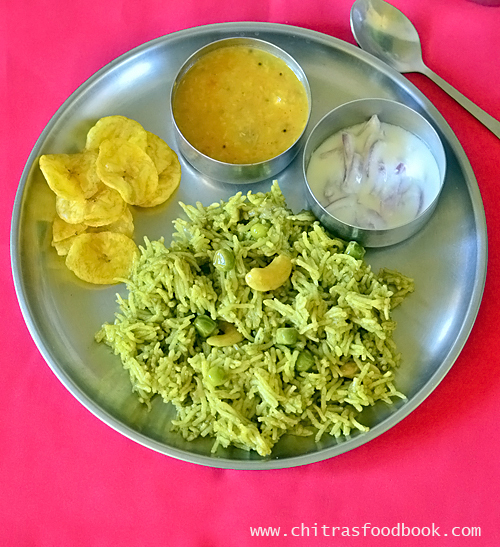 Yummy Tamilnadu style vegetable brinji rice is ready ! Try at home and relish with your favorite side dish ! !